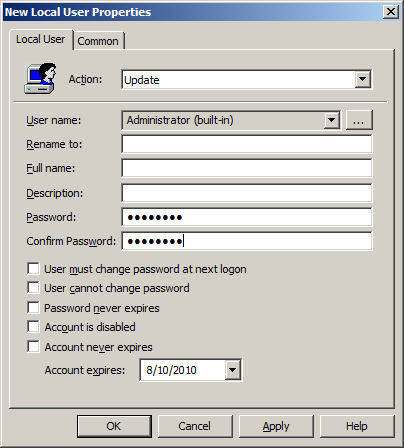 Back in the days of Windows XP IT administrators could disable the local administrator account on domain joined computers but still be able to use the account if they rebooted the computer into safe mode (see How to access the computer after you disable the administrator account ). To log on to Windows by using the disabled local Administrator account, start Windows in Safe mode. However this behaviour has change since Windows Vista (and 7) and now you are no longer able to logon to a computers local administrator account if it is disabled (see Built-in Administrator Account Disabled ). This presents some challenges as IT administrator as sometime you still need to ability to logon to a computer using the local administrator. The most common scenario you need to do this is when you need to troubleshoot domain account issues (e.g. re-join the computer to the domain) when the AD computer account has been reset or deleted or the password has become out of sync and you get a workstation trust relationship issue (see below). The problem is that the local administrator account is now disabled and due to the new behaviour of the account you can no longer log with it using safe mode. 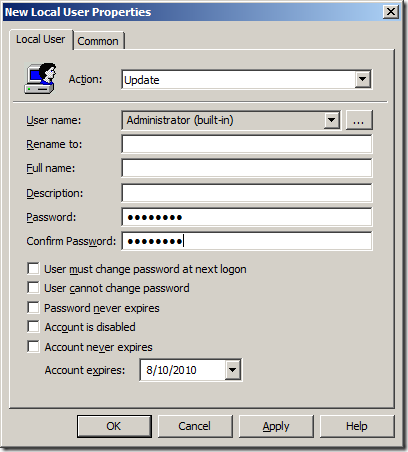 The built-in administrator account is disabled by default in Windows Vista on new installations. This of course makes it almost impossible to configure the computer into a workgroup so that it can then be re-added to the domain to fix the problem. Its even more difficult if you have BitLocker encryption enabled on your local hard drive. It is possible that you could logon with a user with local administrator access using cached credentials however this is limited to the last 10 people that logged on (increasable to 50 if you change the CachedLogonsCount below registry key). But even so, this would also mean you have to know the username and password of the account at the time they last logged onto the computer. This may be a bit hard to do as they may have changed their password a number of times since they logged on to that computer. Unfortunately, it is also much more unlikely now that the normal local user of the computer has not been given local admin due to all the improvement with Windows 7 (e.g. UAC) that allows users to work with standard user permissions. Now you might think the really obvious solution is to just enable the local administrator account and set a password in advanced using Group Policy Preferences (see below) so that you can use it when you need to however doing this has a few security issues. So to get around this issues you could just set the password on a regular basis using Group Policy Preference (see above image) however this also has a few problems as well… While setting the local administrator password is easy to do however it is stored in the SYSVOL as an encrypted string that is fairly easy to crack (see Passwords in Group Policy Preferences ). A password in a preference item is stored in SYSVOL ….. it is not stored as clear text in the XML source code of the preference item. However, the password is not secured. Note: That all being said it is still a really good idea to set a password for the local administrator account as the default password is configured as blank. The other solution you might think of is to boot the computer using a third-party tool that can reset and enable the local admin account (see http://www.bing.com/search?q=sethc.exe+%22windows+7%22+administrator+password&form=QBRE&qs=n&sk= ) however these tools don’t work if your local drive is encrypted with BitLocker nor are they supported from Microsoft (see Microsoft policy about lost or forgotten passwords ). If you want help to break or to reset a password, you can locate and contact a third-party company for this help. You use such third-party products and services at your own risk. So lets assume you have a computer that is no longer properly connected to the domain with a disabled local administrator account. The computers local system drive is BitLocker encrypted and and you don’t know the credentials of any other accounts that have previously logged on with local administrator permissions… What do you do? This is a good post and goes nicely alongside the post I recently made on how to reset an Administrator password in Windows Server 2008 R2/Win 7 (and WS2K8/Vista) in case you’ve forgotten it (like I did) or someone changed it and doesn’t remember it (or it can’t be beaten out of them). wow this saved my a$$ great article! Really a great article,it worked. Handy article, worked fine – except that when I then log on as local administrator, it won’t let me do a lot, e.g. (most relevant here, obviously) control panel -> system -> advanced system settings: it does nothing. Really nothing – no “access denied”, no error messages of any sort, no events logged. Just nothing. After you have enabled the account are you rebooting and going back into normal mode? Or is your administrator account actually an admin? or just a dummy admin account. Boom Click! You sir, are a genius. I didn’t have Bitlocker, but Windows 7 did have a disabled admin account. I used Trinity Boot Disk to blank the admin password and your registry change to unlock my disabled admin account. Yay! Neat article, but I found a quicker way, turn off the computer, unplug the NIC, turn it back on, log on as the domain admin . Once logged back in, plug the wire back in, unjoin the doamin, reboot (first set Local admin password if needed), rejoin domain. Great info, but how did you know that a value of 10 would make it work rather than any other? I guess what I’m getting at is: do you have a reference guide that lists different values and their function. For example: expiring an account, unlocking an account, etc? I got right to the end but where I had to change 11 for 38, the 11 wasn’t there. infact it wasn’t anywhere in the binary string??? I operate on win 7 ultimate. My ONLY login account was an administer account. The account has become disabled and I am told to see my administrator on each attempted logon. I have tried to boot up using the win 7 ult installation disk. It will not boot from the disk. I have tried to enter safe mode but it will not boot in safe mode. Any suggestions on how to bypass the disabled Windows logon? this described exactly the problem I had, and this is the only article I found on how to solve the problem! After enabling the BitLocker on the system drive, the registry files should be inaccessible. Every time when I get locked out of my computer, I’ll use PCUnlocker Live CD and it can reset password and unlock/enable user account. Perfect walkthrough. Just saved my bacon. Your instructions couldn’t have been any clearer.. thanks! When I purchased this emachines computer, it had Desktop Gadgets on it. I noticed after several months of use that the clock and temperature were blank. Updating Windows seemed to help a few times but eventually I got a notice that Desk Top Gadgets were corrupted. It’s still on the list when I click on the start button so I clicked on it. A block came up stating “Desktop gadgets are managed by your system Administrator”. I thought I was the administrator since this computer is for home use only. How do I access Group Policy to list myself as administrator so I can access Desktop gadgets? Amazing! You saved me a day of work. Thanks! I will make sure to bookmark it and come back to read more of your helpful information. that’s a very great article. i have same issue with the encryption using Win 7. but the encryption software was not bitlocker. i am using mcafee safeboot. do you any clue to enable local admin encrypted with safeboot ? What’s the deal, the article ends without explaining anything and all the fake comments on here just link to the same article. You must see Pag 2. Oh. My. I upgraded an old computer in the office to windows 10 that used to be connected to an old domain. The new install disabled the local admin account and we were locked out. You can’t log in to safe mode without domain credentials… Nothing. Changing that value worked! I also disconnected the network cable at the same time, but I’m attributing it the regedit. I also initially made the mistake of trying to open the wrong Sam file at first. Make sure you browse to the d: drive!! Thank you!! Awesome…..it worked! thank you very much! I simply use internet for that reason, and get the latest news. This worked great! Luckily, we have 2 admin accounts on ours because one was Locked as well as being Disabled. Is there a way to Unlock these accounts as well? I can finally sleep because I found your baller guide. None of our company’s enterprise programs could boot from uefi, so they couldn’t see the new nvme drives’ SAM file. Tried so. Many. Things. This was the one that worked. Also this taught me exactly what those tools do! I have become the tool!